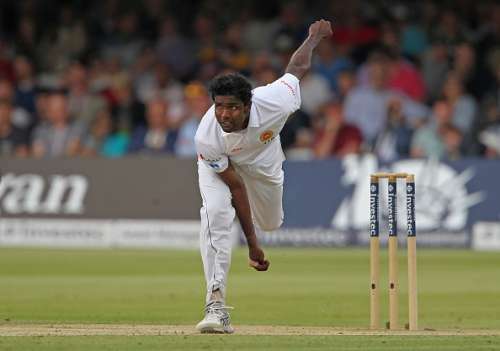 Sri Lanka’s Shaminda Eranga’s day got a whole lot worse with the International Cricket Council (ICC) releasing an official statement confirming that his bowling action has been found to be illegal. The finding of the independent assessment means that Eranaga, who had earlier in the day been hospitalised after complaining of a heart ailment, has been suspended from bowling with immediate effect. Eranga had been reported for a suspect action by on-field umpires S Ravi and Aleem Dar during the second match of the recently concluded three-Test series between hosts England and Sri Lanka. With the ICC rules stipulating that a bowler reported for possessing an illegal action should get himself tested at an ICC Accredited centre within 14 days of being reported, Eranga had undergone testing at the Loughborough University in London on June 6. The results of these tests have now revealed that the 29-year-old’s bowling action was indeed illegal, as all his deliveries exceeded the 15 degrees level of tolerance permitted under the regulations. Eranga, who holds the distinction of being the only bowler to pick up a wicket in his very first over in all three formats of cricket, will not be allowed to bowl in any international match as well as domestic matches organised by the various national associations over the world. He can, however, be permitted by Sri Lanka Cricket (SLC) to bowl in domestic cricket matches played under its jurisdiction in the island nation. Eranga can apply for a reassessment after getting his action remodelled and rectified, though the initial concern will remain about his medical condition. An official medical bulletin is still being awaited as the bowler’s condition still remains unclear though the Sri Lanka team management revealed the reason behind his hospitalisation. "Eranga had an elevated heartbeat prior to the innings (during the 2nd ODI between Sri Lanka and Ireland) commencing and was taken to hospital for tests," Sri Lanka team manager Charith Senanayake told ESPNcricinfo. "He's doing good but in hospital till Monday to complete all tests." Apart from the personal setback, Eranga’s absence will come as a major setback for Sri Lanka who are seeking to avenge their disappointing 2-0 loss in the Test series against the hosts in the upcoming 5-match ODI series.